Thank you for visiting. Here are links to our various ministries. A Slice of The Good Life is our radio ministry that airs weekdays in 32 states and 89 outlets, plus Canada, England and Philippines (see stations and locations). Each day you receive 60 seconds of refreshing hope – you may even want to share it with family and friends. The Good Life Radio Show is my daily hour long talk show heard in Hawaii and North Carolina featuring inspiring stories from business leaders, military personnel, educators, politicians, athletes, entertainers church leaders and more. You will be encouraged and inspired by listening to their testimonies. 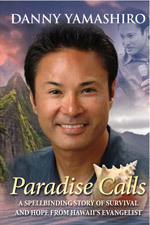 “Against All Odds” is my story of how I fell 400 feet off the Pali Mountains in Hawaii and survived. Through that experience, God saved me for a greater purpose. It’s takes a little more than 5 minutes with pictures and videos of breathtaking views. My tract also titled “Against All Odds” was recently published in Spanish, “Contra Todos Posibilidades.” Download a Copy here! 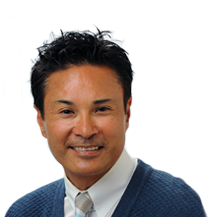 You’ll find other resources including my biography, books, CD’s, latest newsletters and opportunities to stay connected. 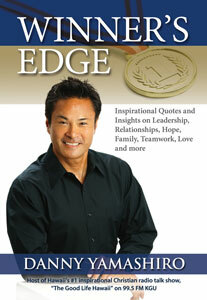 Be encouraged by Danny Yamashiro’s latest book. This is a compilation of some of his favorite quotes on Leadership, Relationships, Hope, Family, Teamwork, Love and many other topics. One great idea can change your life forever! Read Danny’s inspiring testimony about how he fell 400 feel off the Pali Mountains in Honolulu, Hawaii and lived to tell the story. Completely redesigned, this will be an inspiration to you and one of your favorite gifts to share encouragement, hope, and faith with your closest friends.